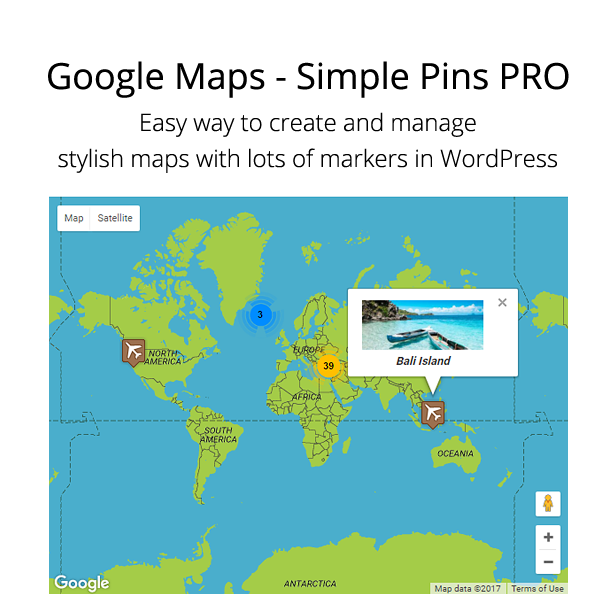 Google Maps – Simple Pins PRO allows you to insert and manage maps on your website easily and efficiently. Create multiple maps without any limitations. Every map can contain any reasonable number of markers. Add info-windows to your markers to make the map more informative. Add images and urls to info-windows. All maps and markers can be edited even when already used in a post, page or sidebar. One page can contain multiple different maps and the same map can be used multiple times. Specify width and height of your map upon inserting, use different sizes for the same map in the locations of your choice. Click here to learn how to update to GMSP PRO. Great plugin, find it very easy to use!